Swamp Wallaby and The Big Wave… What’s a Wallaby Anyway? Young wallabies, like their larger kangaroo cousins, are called joeys. Even after a joey leaves the pouch, it often returns to jump in when danger approaches. So, why would a wallaby want to surf??? Well, our ‘friend’ Swamp Wallaby has lived his entire life in the vast Australian outback — but has always dreamed of living a life of adventure. 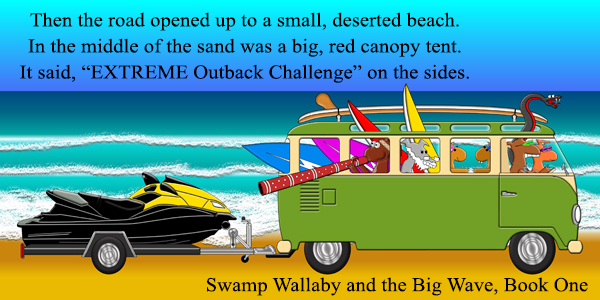 When he hears about the Extreme Outback Challenge… Well you can only imagine what happens…as Swamp and his friends travel across the desert to enter the competition and surf the most EXTREME wave of all!